Total cost of project: 28.2 million. – shared between the City; Province of Alberta and the River Valley Alliance. 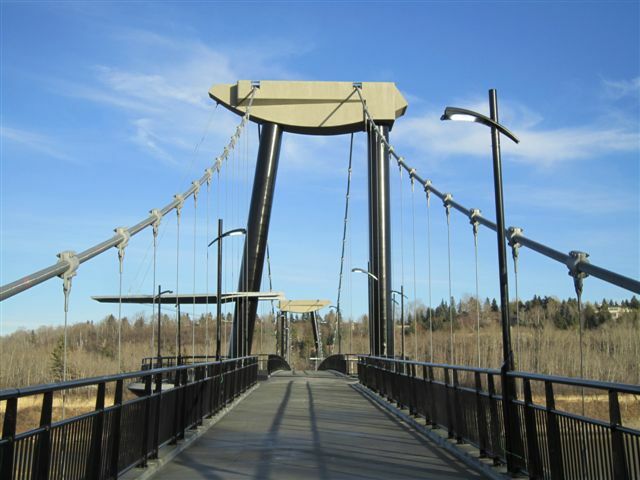 It is classified as a suspension bridge. Believed to be the second largest in Alberta. 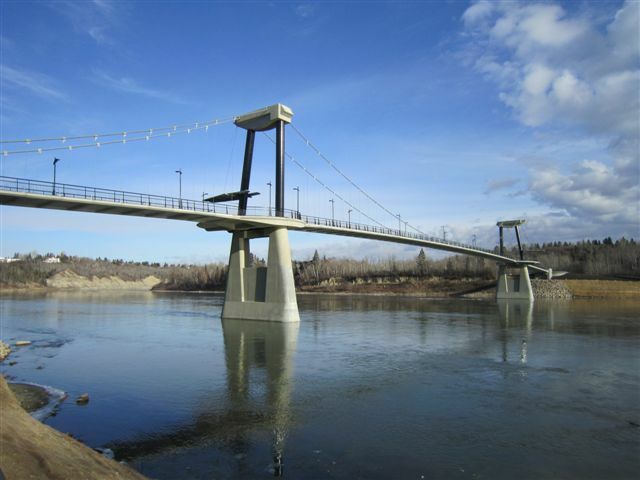 First footbridge to be built in Edmonton since 1985. 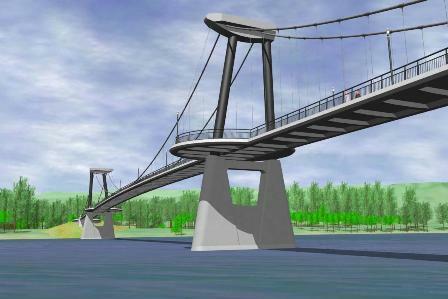 Footbridge is 250 metres long and 5 metres wide. 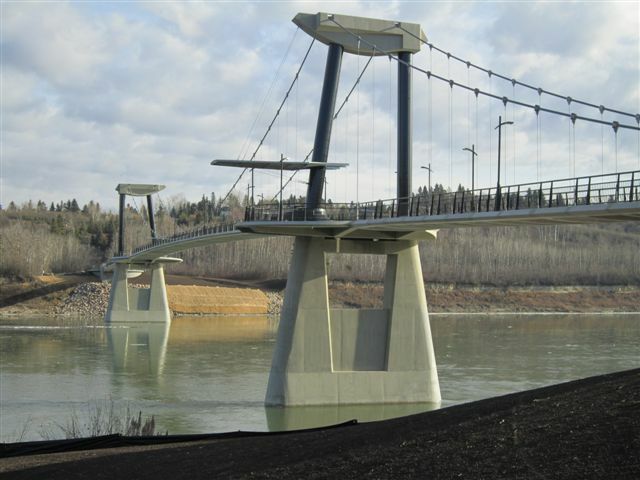 The bridge deck is only 300 mm thick and is composed of several individual pre-cast concrete segments which are tied together as one unit. 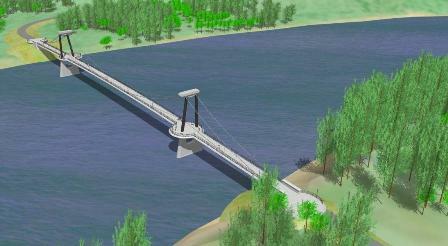 The bridge has only two piers in the river, meaning less impact on the river environment. Different construction components have come from around the world: the cable was manufactured in the UK and then assembled in the US. 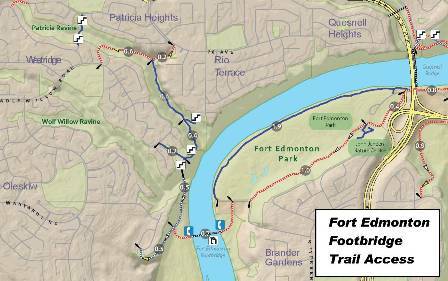 Total of 2.5 km of new trails built. Final trail connections will be completed in 2011. Funded through the River Valley Alliance. Paving of the trail from the east end of the bridge east to Whitemud Rd. Paving from the west end of the bridge to the trail junction and to the bottom of the hill. Landscaping will be completed with some tree/ shrub planting around the trail. Fencing will also be constructed to provide some boundary areas around the trails and bridge entrance where it is best suited. New stairs were constructed at Patricia Ravine. A new walking bridge was built across Wolf Willow Ravine. Final construction and grand opening will occur in spring 2011.